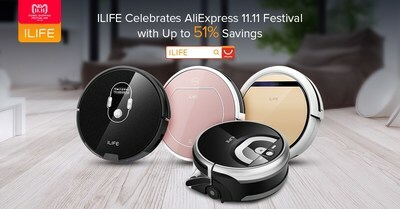 SHENZHEN, China, Nov. 8, 2018 /PRNewswire/ -- ILIFE, a user-driven innovation company specializing in robotic cleaning technology, is offering a variety of amazing deals on its signature lineups to celebrate AliExpress 11.11 Global Shopping Festival. ILIFE customers will be able to enjoy discounts of up to 51% onÂ the V series vacuum/mopping robots, V7s Plus, V5s Pro; the A series carpet cleaning specialist robots, A8 and A7; and the newest floor wash robot W400.Â These products are invaluable to any family or individual looking for a hassle-free way to keep their home clean. The promotion will officially commence on the 11th of November (PST), and continue till the 12th of November (PST).Â Pre-orders are now available on ILIFE's Official Store and Spain Store on AliExpress.com, where customers can find early-bird special offers. High-Performance Vacuuming and Mopping Robot -- V7s Plus: Dirt and dustÂ are easily extracted byÂ its combo of brushes and suction and then thrown into the dustbin, and stains are effectively removed by the microfiber mop cloth. Additional, with a high capacity battery, V7s Plus can effectively clean multiple rooms and large spaces. More Serious thanÂ it LooksÂ -- A7: With the exceptional CyclonePower Cleaning System, A7 can perform high-efficiency cleaning and tackle complex tasks to offer practical home cleaning solutions.Â A7 can beÂ activated through a multifunctional App, remote control or the button on the body to meet the ! needs of different family members.